At Christmas we celebrate the birth of a Jewish Carpenter. But why…what does it all mean…and what is the significance? This is the fourth in a series of short devotionals about Jesus’ birth, so if you’ve missed the previous ones, catch up on those to fully understand today’s final segment. Let’s consider the Tabernacle, and a specific feature: the Ark of the Covenant. God chose to make His presence known to the Israelites there as they wandered in the wilderness. The Ark was made of acacia wood, but was covered in gold. Acacia trees are not typically used to make things. In fact, they are thorny! In Scripture, thorns represent sinful people. You may have some “thorny” relatives or friends and, at times, we can all be a bit thorny! Yet, in us, the undesirable, God chooses to dwell…to make His presence known! He makes His home in thorny, sinful, chopped down trees! But the Ark was covered in gold! The holiness and righteousness of God covers us. His blood atones for our sin, his death on a wooden cross paid our redemption price, and when He rolled the stone away, He gave us new life! The life of a believer in Jesus is not a perfect life. We still sin. Yet we are forgiven, and we don’t want to go on sinning. Just as Jesus died on a wooden cross, so we must “crucify ourselves daily.” (Galatians 5:24) In doing so, He rolls the stone away so that we might have life! In John 2:19-21, Jesus, the Carpenter, talked about a building project when He prophesied that the Temple would be destroyed, but raised up again in three days. In hindsight, He was obviously talking about His resurrection. Likewise, on the night of His arrest, Jesus spoke of a future building project when He said, “I go to prepare a place for you.” (John 14:3) The Jewish Carpenter continues His building project even today! Matthew 16:18 tells us He is building His church, even as He prepares the eternal dwelling for those of us who trust in Him! 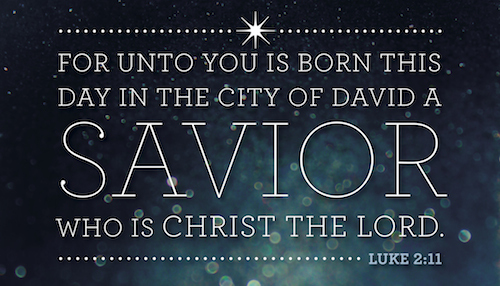 This Christmas, as you gaze upon the Babe in the manger, stop to consider the Jewish Carpenter. From the beginning of time, God desired fellowship with us, His frail wooden vessels! So much so that His Son hung on a wooden cross to make it so! That same Jewish Carpenter has now come to dwell within us until He returns to take us to the place He is preparing. He is fashioning us into the tool or vessel God the Father has intended from the very beginning. The manger is our reminder of how He loves us and desires for us to live life to the fullest in the calling He has given us. Live well…and live free in Him!